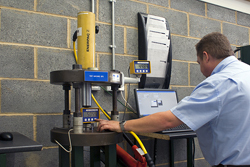 Careful investment and installation of new load cell test machines enables Straightpoint to offer a world class re-calibration and repair service. In order to maintain the accuracy and function of your lifting load/force measurement products, be it either SP branded or otherwise, scheduled calibration and maintenance needs to be carried out as a recommended element to owning this type of equipment to ensure continued safety and accuracy when lifting. As part of SP’s distinct recognition of this; we provide calibration and repair facilities based not only in the UK, but also in the USA, and at appointed distributors spread across the globe in key locations. 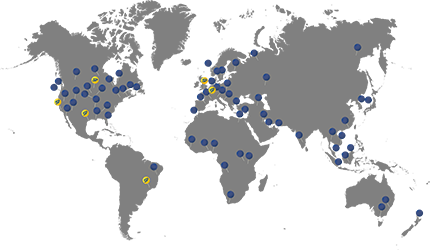 These value added locations have the main advantage of having the device returned and back in action much faster than sending it to a single hub, and lessens the chance of delays from worldwide transport holdups. Our standard turnaround time for this work is 3-5 working days, although any special issues and considerations may require additional attention. Straightpoints’ calibration and repair industrial facilities at our UK and USA facilities serve all countries across the world. They are equipped with a range of load cell calibration test rigs (with closed-loop, servo-controlled testing ability) up to 350te / 770,000lbs. All types of load cells, dynamometers, crane scales, loadlinks and other force transducers maybe calibrated and certified including Mantracourt, Strainstall, JCM Load Monitoring, Scotload, Dillon, Tractel, Eilon Engineering, Red Rooster, Elite Transducers, Yale and many more – as well as our own brand products. It is important load systems used to measure and monitor forces across industry are optimised for peak accuracy, providing predictable output to recognised standards. The Straightpoint facilities can apply and exert a wide spectrum of known loads and forces - from just a few kilograms or lbs to many hundreds of tonnes – to test and calibrate load cells and force sensors supplied by clients. 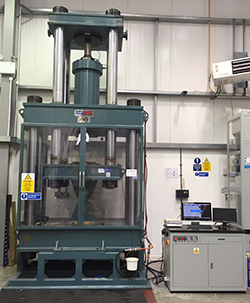 Machines installed at the Straightpoint facility are UKAS ISO 17025 / NIST traceable rigs, Class 0.5 standard and certified by the National Physical Laboratory in London. When to calibrate load cells, digital dynamometors and other force sensors? Load cells tend to become unstable or drift for a variety of reasons. Factors that can adversely affect function include gradual degrading of the load cell, instrumentation fault development, cabling and termination, electrical influence and mechanical effects. Failure to inspect or clean load cells is a significant factor that can lead to operational, functional and calibration issues. Particulate matter can build up around load cells and load cell mounts over time, even in clean environments. Outdoor load systems face more variable-to-extreme conditions. Weigh systems such as crane scales are subject to inclement and seasonal changeable weather, leading to problems developing in previously accurate load cells. A typical problem might be with connected load cell drains that can cause force sensor failure over time. 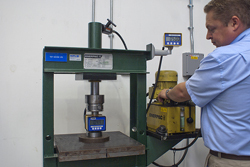 Calibration technicians in our service department are always available to discuss client requirements and related load cell and force measurement issues. Important Warning: When a load system fails to function, not delivering any force measurement or monitoring information, do not simply disconnect the system. An investigation of the full load system is normally required to ensure return to safe and high performance operation. Simple re-calibration of a single faulty load cell within a system may have dangerous effects leading to mechanical failure. Straightpoint offers world class aftersales, care and calibration and is committed to a two-three day turn round, endeavouring to calibrate, certify and despatch equipment to any international location worldwide, within two working days of receipt.